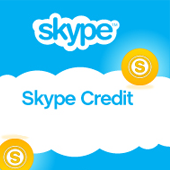 Refill Skype Credit 1. When you complete order you will get SKYPE Credit Code. 2. go to LOGIN HERE 3. Login with your username and password 4. Clcik Redeem Voucher or CLICK HERE 5. Put the code that you receive Your Download section or Email. 6. Credit Will add instantly your ..